Quinton Guthier trained at The School of Madison Ballet in Madison, Wisconsin, before moving to Northern Michigan to train at Interlochen Arts Academy. There he studied with Cameron Basden, Nicola Conraths, and Wendy Masterson. He studied ballet, modern, gyrotonics, and somatics. During his senior year at the academy, Quinton was accepted into the Ailey/Fordham B.F.A. program in NYC. During his four years at The Ailey School, Quinton studied a variety of techniques including Horton, Graham, Ballet, and Taylor. He studied under the instruction of Milton Myers, Ana Marie Forsythe, Elizabeth Roxas, Graciela Kozak, Peter O’Brien, Peter Brandenhoff, Jacqulyn Buglisi, Penny Frank, and Carolyn Adams. 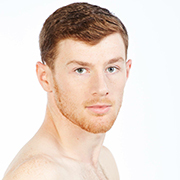 Quinton has performed works by Martha Graham, Jessica Lang, Darshan Bhuller, Robyn Mineko, and William Forsythe. Quinton has performed and taught abroad in Costa Rica and Nicaragua with JUNTOS dance collective. He has also performed works and has been mentored by Matthew Rushing. Quinton has had his own choreographic work presented in NYC at The Dance Gallery Festival.